Directions: On this worksheet you can practice calculations involving the continuity equation and Bernoulli's equation. The large container shown in the cross section above is filled with a liquid of density 1.4 x 103 kg/m3. A small hole of area 2.8 x 10-6 m2 is opened in the side of the container which allows a stream of liquid to flow through the hole and onto the nearby counter surface. 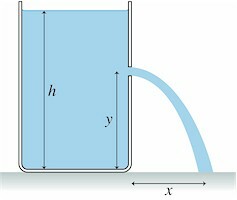 At the same time, liquid is also added to the container at an appropriate rate so that h = 63 cm remains constant. If the hole is 37 cm above the base of the container, at what speed will the water escape? Question 2 How much fluid, measured in cubic meters, must be added each second to replace the water exiting through the hole? Question 3 At what range, x, does the water stream impact the counter's surface? Question 4 Why did you not need to include atmospheric pressure when calculating any of these answers? Question 5 Water is pumped out of a well at 6.3 m/s through a 7 cm diameter hose. If the well is 48 meters deep, how powerful is the pump? A fountain at a park has an opening of radius 0.024 meters which shoots a stream of fresh water vertically from ground level at 6.3 m/sec. The fountain is fed by a pipe that at one point has a radius of 0.032 meters and is 3.15 meters below the fountain’s opening. 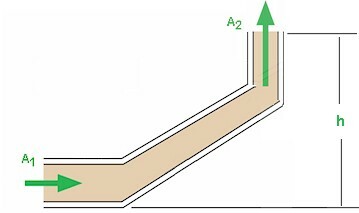 Calculate the absolute pressure in the pipe while it is underground and has area A1. 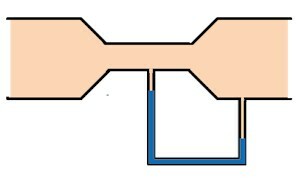 In the diagram shown above, air is flowing through a pipe. If the radius of the large pipe is 2.4 times greater than the radius of the constricted region, how fast is the air traveling in the constricted region when the difference in the heights of mercury levels in the manometer tubes is 13 cm? NOTE: The density of mercury is 13,600 kg/m3 and the density of air is 1.28 kg/m3.